On September 26, 2013, the World Peace Foundation hosted a book signing and discussion of Lidwien Kapteijns’ new book, Clan Cleansing in Somalia: The Ruinous Turn of 1991. Kapteijns, a Somalia scholar–an expert on Somali literature–and professor of History at Wellesley College, presented her work as part of the World Peace Foundation’s “Patterns of Violence in Somalia” seminar. She was joined by David Laitin, professor of Political Science at Stanford University, and Faisal Roble, Director of Research for the Institute for Horn of African Studies and Affairs. The event was moderated by Alex de Waal, Executive Director of the World Peace Foundation. 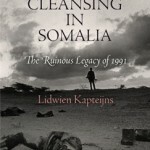 Kapteijns’ book is a study of the use of large-scale, clan-based violence against civilians in Somalia between 1978–1992, with an emphasis on the politically-instrumented clan cleansing campaign of 1991 which coincided with the collapse of the Somali state. Her project initially began as a study of Somali popular culture about civil war violence, during which she discovered that mainstream music and poetry did not, and indeed were unable to, say who did what to whom during the war. This insight shifted her into a journey to document important under-reported events of civil war violence at the time of the end of Siad Barre’s regime and the breakdown of the Somali state. Kapteijns chose the term “clan cleansing” as a parallel of “ethnic cleansing” because they both refer to a campaign of identity-based mass violence where warlords aim to destroy alternatives to their own power. Noting that clan-cleansing campaigns would have been unthinkable without the history of the Barre regime’s oppression of clan identity, Kapteijns identified 1991 as a “key shift” in the role of clan in Somali history. First, 1991 was the first time politico-military leaders used large-scale clan-based violence on civilians outside the state apparatus. It was thus the first time leaders purposefully incited civilians to become the perpetrators of such violence: as survivor testimony shows, civilians were targeted based on their clan identity even by people who knew them well – in fact, precisely by people who knew them well. This drew a new line based on clan that cut through the former political divisions whereby Barre regime supporters fought against opposition fronts. Clan was now the salient identifier, resulting in the targeting for violence of both direct victims of the Barre regime and its stalwart supporters, solely based on clan affiliation. Finally, Kapteijns argued that historical denials of this violence have been so widespread as to become almost diagnostic. Some accounts simply skip the clan cleansing event while others mischaracterize them in the logic of political revenge killings, which side-steps the responsibility of the leaders and results in interpretive denial. She specified the impact and denial of this violence as her major concern, as it continues to undermine state building in Somalia today. Most importantly, she asked how to speak truth to this history, to bring it into the present, without doing more harm? She argued that one way is to reject the notion that clans killed; rather, individuals killed in the name of clans. Mythical group hate narratives must also be rejected. Such narratives are organized around themes of betrayal and victimization, and downplay other identities. By using mythical time, long-term group history overwhelms the present time of normal, everyday life where diverse groups peacefully share their communities, resulting in a pressing urgency for group survival or victory. These hate narratives became discursive triggers for the initiation of Somalia’s clan cleansing. Kapteijns said also that clanship should matter and not matter at the same time – it should not ever be naturalized or taken for granted within individuals, while nonetheless it does have a great deal of power. Moving forward, Kapteijns contended that a restorative justice campaign is not appropriate for Somalia. Somalis themselves are already producing their own commemorations, mediations and engagements in many different mediums. She sees her book as one more mediation in this space, encouraging a dialogue where the truths of 1991 should be recovered and discussed. Acknowledging that the past is a contested place, Kapteijns encouraged all interpretations at the table, not because she feels all are factual, but because they represent how people see and feel about the past, which is equally important. Following Kapteijns’ presentation, the event opened up to include the voices of other seminar participants and the audience. Alex de Waal interpreted Kapteijns’ book as a caution to international actors to not fall easily into simple narratives, either in Somalia or elsewhere. David Laitin emphasized Clan Cleansing in Somalia’s seminal contribution to the field, particularly what it teaches about how in Somali poetry alliances and identities are constantly shifting and different groups are able to engage with one another across clan lines for reasons of short-term political calculus – this makes it all the more perplexing that clan-based violence can occur. Faisal Roble said the book’s most profound issue is its analysis of how state-building in Somalia is slipping because of the failure of collective memory and clan management, one which makes the book very uncomfortable for some Somalis to read. Kapteijns took the opportunity to emphasize that in asking the big question of how large scale violence against civilians is possible, it is crucial to remember that under the right circumstances it can happen anywhere. Kapteijns and Roble said they believe that Somalis hurt by the violence are ready to reconcile, that the hopelessness currently faced is one of political reconstitution, not of moral repair. Somalis are ready to speak about grievances, but what they are still waiting for is effective speech about the history and trauma of the clan cleansing violence.